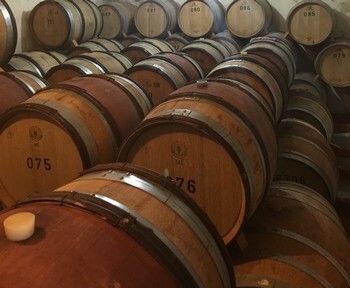 Your behind-the-scenes look into Israeli Wine Direct and the re-emerging Israeli wine scene! We’re on to Day 3! So far, we have stayed in and around the Tel Aviv area. Today, we travel north! As a special treat, our IWD Israeli Representative, Tamir Ronen, who is our eyes, ears and taste buds on the ground in Israel, joins us today! Tamir lives in the Moshav Mei Ami, just across the road from the Arab city Umm Al-Fahm. We pick up Tamir, have a quick cup of cappuccino (Israelis love their cappuccinos), and head to meet Meir Biton from Kitron Winery, at his home in the religious communal settlement Hoshaya. The Kitron Winery is located in Netanya however they are currently building a new gravitational winery in the Lower Galilee. A gravitational winery, or “gravity flow” is typically built on multiple tiers, each tier for a different phase in the winemaking. This allows the wine to flow naturally, which enables the wine to preserve as much color and flavor as possible, rather than pushing the wine with air and pumps. Meir studied this kind of winemaking in Burgundy and in Sonoma and it will be the first and only one of its kind in Israel. We took our leave of Meir and his lovely home and headed to a meeting we were all particularly excited for because it will be a new winery for Israeli Wine Direct to represent this coming spring! 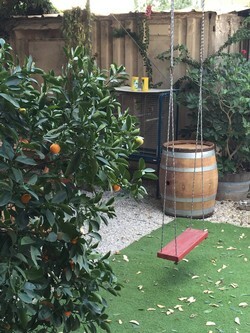 Kishor winery is located in the Western Galilee, nestled within beautiful rolling hills, a part of the Kishorit community, a home for a adults with special needs. Five of the members of Kishorit work permanently in the vineyards and winery, while more members come on to work during the heavy production season. All workers take part in every aspect of wine production, from grape cultivation and vineyard management to wine making, bottling, and marketing, and are managed by Richard Davis, a South African viticulturist and winemaker as well as Itay Lahat, oenologist and wine expert. Keep in mind that the vineyards were only planted in 2007. They harvest their first grapes only in 2010 and the permanent winery was finished only in 2013 so this is a baby winery, in its toddler years, but the wines they make are far more mature than their age! First production yielded 9,000 bottles; by 2013 they had grown to making 34,000 bottles and are seeing a future of over 55,000 bottles so their growth is exponential! To the wine! Their vineyards are terra rosa and limestone and the unique micro-climate of the region helps them grow grapes of excellent quality. Of the grapes they grow, 7 are red (Cabernet Sauvignon, Cabernet Franc, Petit Verdot, Merlot, Syrah, Grenache and Mourvedre) and 3 are white (Sauvignon Blanc, Viognier and Riesling). They have just started to bottle the Syrah and next year will begin with the Mourvedre and Grenache. We will carry 4 of their wines: Kerem Kishor White (blend of Sauvignon Blanc and Viognier), Savant Viogner (100% Viognier), Kerem Kishor Red and Savant Red (both blends of Cabernet Sauvignon, Cabernet Franc and Petit Verdot). Now the moment you (and we) have all been waiting for: the tasting! The first we try is the Kishor White 2013. It is a dry wine, well balanced, expertly made; drinkable, highly enjoyable. Next we try their Riesling, which we don’t carry as of yet. We tasted the 2012, which was one of the last bottles from that vintage, but Richard remarked that with each year, their Rieslings are getting better and better. What we tried was still a very good Riesling. It was sweet and fruity with a nice dry finish that kept the wine from being too sugary. It had a slight petrol odor to it which sounds much more unpleasant than it actually was. The wine was excellent! Could easily last another 10+ years. Richard indulged us next with trying their Rose. Made from 100% Merlot grapes, which are grown specifically for making this rose, it had a beautifully salmon-orange tinge to it. The wine is crisp with a good acidity and a refreshing bouquet, a result of early picking. Next, we moved on to the reds with the Kerem Kishor Red; a dry medium-light bodied wine with a smooth, long finish that isn’t tannic. It is a wine that can be easily had now but will age well over the next 5-8 years. Lastly, we tried the Savant Red, a similar blend to the Kerem Kishor Red, made from Cabernet Sauvignon, Cabernet Franc and Petit Verdot, it has a greater, almost entirely quantity of Cabernet Franc. As such, it is light and peppery with a hint of raspberries. It will be a wine that shall be greatly enjoyed by our customers, it’s that good! After chatting for over three hours with Richard and Yair, we took our leave, elated to have tried these outstanding wines and to have met these impressive people. And excited to be bringing these wines here to the States; we hope you are, too! The first day was a fantastic start to our trip! Unfortunately, the weather on the 2nd day put a bit of a damper but our meeting with Midbar owners Itzhak and Shelly Wolf more than made up for the unusually cold and wet Israeli winter. 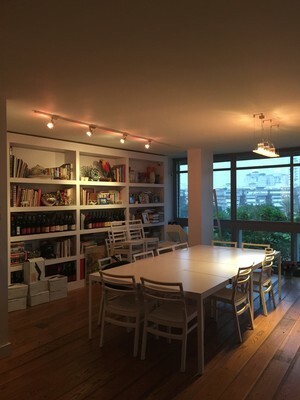 We met at their beautiful apartment in Kikar Hamedina, the largest plaza in Tel Aviv with chic stores and quaint cafes. Originally, we were going to travel south to the winery in Arad to see them and vine grower, Eran Raz, but the weather prevented us from doing so. It is unfortunate because they had scheduled for that day a religious ceremony to make the winery kosher. That’s right, readers; Midbar Winery will now be producing KOSHER wines! More on that a little later but it is a very exciting announcement. As always with winemakers, wine importers and wine lovers alike, when you have a meeting, you must have some wine; and maybe a little something to eat, too. We started right off with their 2013 Unoaked Chardonnay, which we have never tried before. It was crisp and fruity, with a pale yellow, almost greenish color. Not as tart as the Pelter Unoaked Chardonnay that we already carry, but just as refreshing. Our customers in the States have always enjoyed the white wines we import from Israel so the hunt to find new and delicious white wines is always on! Next we tried the Viognier; we carry the Midbar White 44 and have sold out of the Southern White, which both contain this special grape, but what we tasted was a 100% Viognier, and we loved it. It was floral and buttery, rich and full bodied yet still dry, so golden in color one would almost think it’s a sweet wine, like a Sauterne. The Viognier impressed us, the Midbar blends are all enjoyable but the single varietal wines, which Itzhak explains, he only uses the best grapes for, are truly spectacular. When you realized that the winery is still young, the quality becomes even more impressive and the promise of what to come makes it all the more exciting and enjoyable! Since the rain hadn’t abated yet and it was our only meeting for the day, we indulged in a few more samples of wine, moving on to the reds. The first one was the Red 55, which we unfortunately don’t carry, but was remarkable. Asking Itzhak why they chose “55” in the name, he answered that they were looking to create a memorable number with no particular meaning, perhaps only a mystique, like Heinz 57. Back to the 55, it is a blend of Cabernet Sauvignon, Merlot, Petit Verdot and Cabernet Franc. The wine is smooth and subtle, with a light finish. The Wolfs don’t like tannin in their wine and that cannot be anymore evident than in the 55. It has a deep garnet color and the bouquet is heady with perfume. Our last wine was the 2013 Cabernet Sauvignon 800, which we do carry, but the 2012 vintage. According to Itzhak, this is exactly the wine that defines Midbar Winery, “for the good and the bad, its exactly a desert wine”. If you tasted the wine, you already know its quality. If you haven’t had it yet, do! It tastes of blackberries and pine with a soft, earthy finish. The conversation moves to Midbar’s becoming Kosher and what that has meant for the winery. To put it simply, it was done to increase sales, once a winery grows to a certain size in Israel, it makes no sense not to go Kosher. 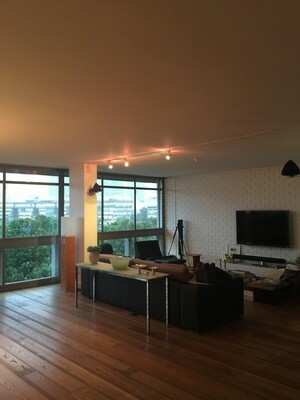 Many people ask if that will have an effect on the quality… it will not! By becoming Kosher, the winery simply needs to be overseen by a Mashgiach, or a religious supervisor. It sounds perhaps a bit less complicated than it really is; but basically once the grapes are harvested, the entire wine production up to shipment, basically, needs to be run by these religious men in order to guarantee Kashrut. 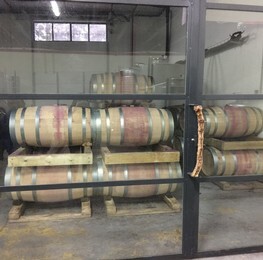 The wine maker, Meital Damry, even Itzhak and Shelly, the company’s owners, can’t taste their wine in the barrels, unless the Mashgiach is there to serve it to them! It’s a complicated process for an ancient belief but rest assured, the wine will remain as great as it ever was and with the coming years and the growing experience of those working at Midbar, it will probably get better! We landed in Israel and immediately hit the ground running. The morning after we arrived, we had a meeting with Margalit Winery. Still groggy from jetlag, we started our trip with a brief tour of the winery with winemaker Asaf Margalit. He showed us their beautiful barrel room before taking us upstairs to a cozy tasting room. We started talk about Margalit wines, one of the biggest cult wineries in Israel. Shortly before opening the first bottle, we were joined by Yair, Asaf’s father, founder and master winemaker at Margalit. Yair could probably be the man credited with starting the boutique winery movement in Israel. A chemist in training, he holds a PhD in physical chemistry, which brought him to California U.C. Davis as a visiting research professor. It was there that his love of wines was, for a better term, cultivated. That was thirty years ago. He went on to be Tishbi Winery’s first winemaker before founding Margalit Winery in 1989. Aside from producing some of the best wines Israel has to offer, he has written not just one but two leading books in wine technology, chemistry and production. If you want to read up more on Yair and his background, read this excellent article written last summer in the Jerusalem Post HERE. Back to our tasting. Never mind breakfast (although there was a beautiful spread of freshly cut vegetables, burekas, cheese and bread, lets have some fruit salad! Ok ok, by fruit salad, we mean wine. Who says we can’t mix business with pleasure? We try the Merlot, which will be a new wine for us to carry this coming spring. It is a perfect Merlot, full of those quintessential cherry, tobacco and chocolaty flavors. Beautifully balanced, easy tannin & rich, this will please all of our red wine-loving customers. Next we move on to the Cabernet Sauvignon and the Cabernet Special Reserve, two of their signature wines. Many of our customers will already be familiar with the amazing quality of these wines. They are outstanding, perhaps the two wines that Margalit is best known for. We try a few more wines, a Petit Verdot that is an in house wine only. It has that characteristically grapey, vanilla and spice flavor one expects to find in Petit Verdot, albeit very tannic, which is why they decided not to put it on the market. Lastly, we try an experiment of the winery, a rose! Now, we carry 3 roses from 3 different superb wineries and are always excited to try more. Sure, they may be considered the fluff of wine, but when it’s hot out, there’s nothing like opening a bottle of crisp rose. Yair explains that they have made a rose that they believe to be exactly what a rose should taste like. We have to agree; it is very good. Crisp! That’s definitely the first word. It was approaching the end of fermentation so there was a slight carbonation to the wine, which made it no less enjoyable. It was fresh, lively, and springy, with grassy and strawberry notes. Will they put it on the market? Let’s hope so! We have one more appointment scheduled for the day at Somek winery, with vintner and Zichron Yaakov native, owner of Somek Winery, Barak Dahan. In fact, Barak isn’t just a native, he is the fifth generation of his family to be living in Zichron Yaakov and the family has been tending the same vineyards all that time! In fact, the vineyard Barak still cultivates is the same land, albeit a bit more has been accumulated over the years, that Baron de Rothschild gave to his family over a century ago! For those who know wine in Israel, the town may be familiar to you, because it came under the patronage of Baron de Rothschild in 1883, when he came to Israel to survey land for agriculture, particularly vineyards. He founded a winery in the Carmel Mountains and set up a bottling plant in Zichron Yaacov, the town was renamed in memory Rotheschild’s father, James (“Ya’acov) and in 1954, Baron de Rothschild’s remains were reinterred close to the town. The Dahan family cultivated their land and sold the grapes to wineries for decades. Finally, ten years ago, Barak and his wife, Hila, decided to expand upon their knowledge and begin making their own wine. Hila then went on to study viticulture and oenology at the University of Adelaide, in Australia. A decade later, their winery has grown, along with their knowledge. We carry several labels by them, all of them fantastic, one of the most notable, perhaps, is their Carignan, a beautiful wine with a wonderful, round texture, firm tannins, and ripe fruits. Another wine that is perhaps less popular, though no less delicious, is the Bikat Hanadiv. In Hebrew it means “blessings of the righteous man”, Barak’s and Hila’s praise of Rothschild. It is a blended wine of 50% Cabernet Sauvignon, 30% Merlot, 15% Cabernet Franc and 5% Petit Verdot and was so named because it is reminiscent of the famous Chateau Lafite. Barak and Hila are have become very knowledgeable winemakers indeed, they are gaining recognition, and rightly so, for the wines they are producing. A year ago, the Jewish Daily Forward wrote a wonderful article, linked HERE, on the Dahans and their wines. Currently, they are even expanding on what they know and are starting to make new wines, one of which, a chardonnay, we were very excited to try. 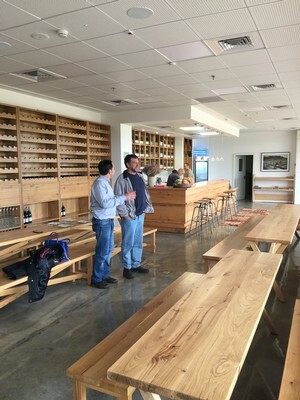 We sit in the newly built, lovely tasting room and sip the sample Barak has brought for us. Like the rose from Margalit, it is still undergoing fermentation, so it also has slight carbonation that will eventually dissipate. The wine will be slightly oaked, to round out the burst of citrus, and will be just as superb as his other wines. The day is getting a bit more precarious. The chickens in Barak’s coop seem to understand that there is a storm coming. Wintertime in Israel is no joke! As we leave the winery, the gusts of wind almost force us back inside. Sad to go, Barak is so inviting and generous with his time and explanations, the conversation was endless and could have gone on longer, we take our leave, excited by all we have learned and tasted in the first day alone! What a successful start to our winery tour, the excitement would not let up, regardless of how much the weather tried to dampen it! It's Time for a BBQ!